Cross-posted from the Inside Search blog. Almost every time I go online, I come across some new topic or item that I’d like to learn more about. Sometimes it’s as simple as the latest buzz on the new shop down the street. Other times it’s something more significant, like a counterpoint to an opinion piece I’m reading. While the answer can be just a simple search away, we wanted to find a way to get some of those answers to you even faster. Now with Google Related, a new Chrome Extension and Google Toolbar feature, you’ll automatically see interesting content relevant to what’s on the page you’re viewing, right where you’re viewing it. Whether you’re reading a news article, shopping for a new pair of shoes or visiting your favorite musician’s website, Google Related works in the background to find you the most interesting and relevant content on the topics you’re currently viewing. 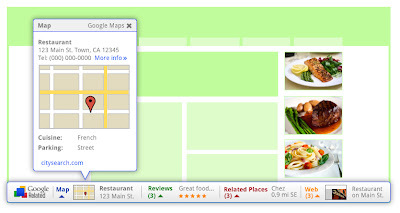 For example, if you visit a restaurant’s website, Related can show you a map, reviews from Google Places, mentions from across the web and other similar eateries that you might want to try. Results will display in a thin bar at the bottom of your screen, and will remain minimized until you hover over them with your mouse. Once selected, they’ll open up immediately in your browser window, saving you the trouble of having to open multiple new windows or tabs. 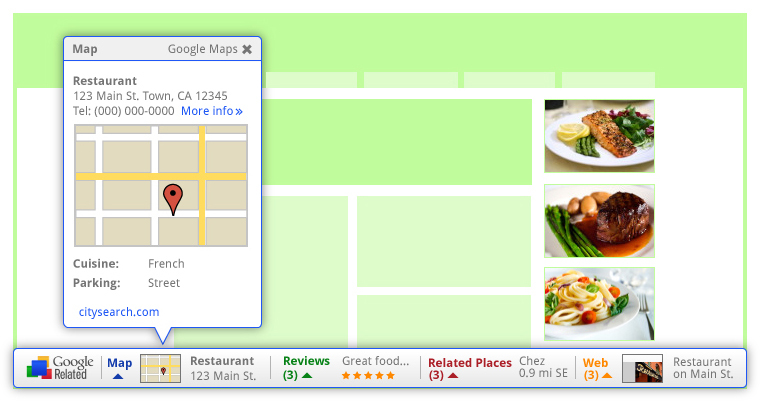 If Google Related shows you something you’re interested in, you can let others know using the built-in +1 button. In order to offer you relevant suggestions, Related sends the URL and other available information about the pages you visit back to Google. If you’re interested in how that data is used and stored, you can learn more here and here. If you decide you’d rather not see the Related bar, you can easily hide it for specific pages and sites through the Options menu. If you use Related as part of Google Toolbar, you can disable Related entirely through the Options menu as well. Google Related is available both as a Chrome Extension in the Chrome Web Store and as a new feature in Google Toolbar for Internet Explorer. Visit www.google.com/related to learn more and to get Google Related today.